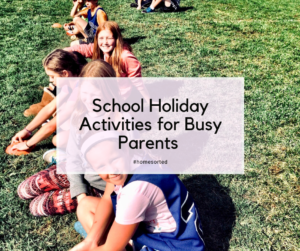 School Holiday Activities for Busy Parents - Home Sorted! It’s that time of the year again – school holidays! Which means one thing! You’re going to need some help planning fun and easy activities to keep the kids entertained. One of the best things you can do with kids – is baking! We love spending a few hours baking and decorating cupcakes and cookies. If you’re not keen to make them from scratch, you can pick up a variety of packet mixes for only a couple of dollars at the supermarket. Arm yourself with an assortment of lollies and icing and you’re good to go! Movie marathons are another favourite, low cost, and easy activity for the school holidays! You can pick a theme like Disney Pixar, or simply let each child choose a film and get watching. We love any excuse to binge watch a movie or three! You can even choose to turn art and craft into a theme day by creating items of a similar nature. A good one for these school holidays is Easter! You can paint eggs, make Easter bonnets, or draw and colour bunny rabbits. If your kids have been asking to reorganise or redecorate their bedroom (you know the kind of nagging we’re talking about), the school holidays are the perfect time! Consider allowing them to rearrange their furniture, put up new posters, or even create a mood board near their desk. This allows them to express their personality and truly create a space they love. Finally, you can’t go past activities that get you ready for the new school term. This could be baking treats for lunch boxes and freezing them. Or turning wardrobe organisation into a game! Do you have the perfect school holiday activity? Tell us about it on our Facebook page.